Highmoon Decoration LLC Company is the only design and decoration company in Dubai which has an 18000sqft joinery factory designed to give quality service to our clients. We are having high end machineries such as glass cutting machine, edge bending machine, leaping and we even have polishing areas for our joinery works. 95% of the joinery works placed in an office or home for interior decoration such as ceiling design, wall paneling, skirting, etc are made in house. We also have very professional architect, interior designers, color them idea experts, best engineers, professional site supervisors and technicians task to give quality services and meet client’s satisfaction. We are here in this industry for 9 years having step by step growth. Highmoon Decoration LLC, one of the interior design companies, Dubai, UAE based is giving excellent idea for office space utilization interior design MEP service, Aquatic solution, Floor and Ceiling idea the office, where we spend the most significant portion of our working lives, should be aesthetically designed. This is the reason that one should always be very careful about the functionality décor of the working space. Our work space, where we spend at least half our walking time, six days a week, is as important a part of our lives as our homes. The working conditions and the environment in the offices directly affect the way people interact with the family and friends at the end of the day. These also have an influence on our productivity, mental well-being and general health. Highmoon Decoration LLC, one of the interior design companies, Dubai, UAE based plans an office effectively, the interior designer (in uae market) should have a thorough understanding of the functional and aesthetic requirements of the client, followed by an in-depth evaluation of the possibilities and constraints of the given space. 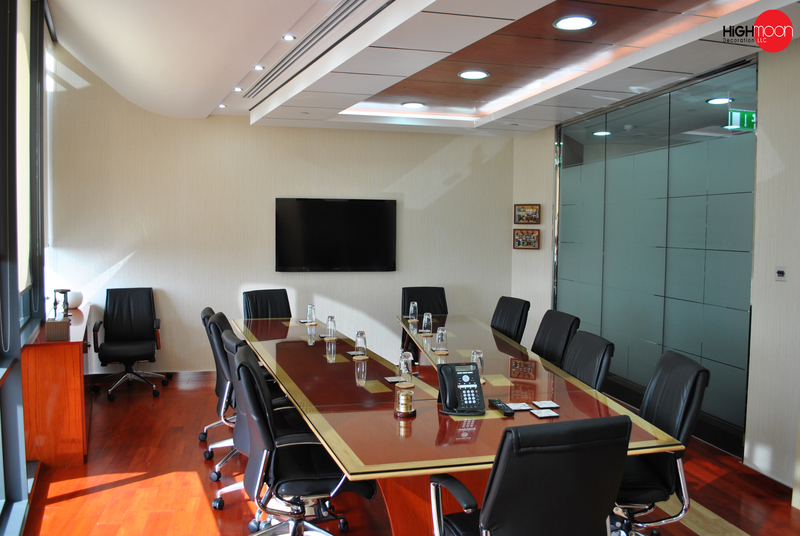 Interior Design Companies, Dubai, design an office that should ideally have enough space not merely to seat its employees, but to locate ancillary and support services, from the stately boardroom to the humble pantry, as well as for circulation between these areas, with adequate access to stairs and fire escapes. When planning a given space, it is important for Highmoon Decoration LLC, one of the interior design companies, Dubai based to conceive a long term master plan, keeping in mind planned growth and future requirements, even if the intention is only to implement part of the plan now and execute the rest as needs and funds arise.